Defense has always won championships and Seattle has the number one defense in the NFL. Seattle is gonna need the captain of their defense, Kam Chancellor to stop possibly one of the most dominating football players in the game, the one they call Gronk. Rob Gronkowski. Kam Chancellor stands 6’3 and is 232 pounds. He is the teams defensive captain and is a nightmare for anyone lined up across from him. With 78 tackles on the season he is a problem for any offence. Just ask Jimmy Graham who in two games had a combined four catches for 50 yards against the Seahawks, or call up Vernon Davis who he has shut down shut down. Then there was that absolute BOOM he put on Demaryius Thomas in the Super Bowl last year . With the physicality of a linebacker in a safeties body he is the perfect match-up for New England’s monster tight end, The Gronk. While defense wins championships on one side , on the other side we know that the best defense is a good offence. When Rob Gronkowski is on the field the New England offence is far from a good offence , it is a great offence. At 6’6 265 pounds he has hands the size of California with the touch of your favorite teady bear. Gronkowski had over 80 receptions, 1100 yards, and 12 touchdowns on the season; including one against the Colts in the playoff game this year. Gronkowski is a monster and New England will definitely need him to play like one come Sunday. With all that said I feel like the edge statistically goes to the Gronk ,but defence is much more than what is on a stat sheet. Chancellor means everything to Seattle’s hard nosed defense.Therefore, my pick is gonna have to be, Kam Chancellor. 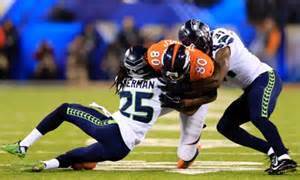 I have to ride with Seattle to win this match-up and in the bigger picture win the Super Bowl come Sunday.